It’s safe to say that everyone could use a little more happiness in their life. While a weeklong vacation, new puppy, or tub of ice cream (my personal favorite) are sure to do the trick, there’s another resource that people often overlook ….music! Think about it. What lifts the mood at a party better than some upbeat tunes or makes a chill afternoon at home more relaxing than some soft melodic notes? Music, in all its forms and genres, has the power to instantly lift our spirits. It makes sense then that people who play music are generally happier than the average person. 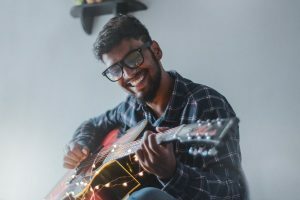 While music itself is responsible for a large portion of that happiness, there are other reasons why musicians are usually happy. Playing an instrument will inevitably introduce you to a wide range of people and will broaden your social circle. That’s because music is a very social activity. On the surface, playing an instrument may seem like a solitary activity, but if you dig deeper, you’ll find music is inherently communal. Whether you take music lessons, join a band, or play at local venues across Phoenix and Scottsdale, you’ll meet so many like-minded musicians who are just as passionate about playing music as you are, And more social activity and meaningful connections means more happiness! Another reason that people who play music are happy is because playing an instrument boosts self-esteem. That’s because learning to play an instrument pushes you out of your comfort zone and challenges you in fun ways. With enough practice and music lessons, you’ll be able to overcome those challenges, and once you do, you’ll feel an immense sense of achievement. Every musical success and goal reached will make you feel incredible about yourself, which, as everyone knows, is the cornerstone of true happiness. As mentioned before, music has the power to move us and beautifully evoke our emotions. Playing an instrument and creating music yourself heightens these feelings, and is a great way to release your emotions. No matter what you’re feeling, playing an instrument can help you tap into those emotions and work through them. Thus, many people find that playing an instrument can be almost therapeutic and very cathartic for the soul. 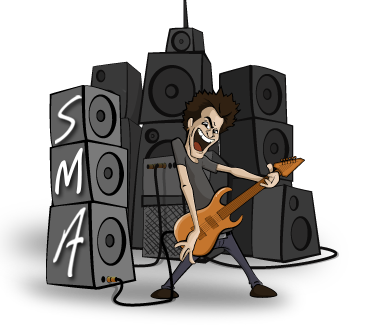 No matter what you play—guitar, drums, keyboard—or whether or not you take music lessons, the simple fact that you play an instrument is guaranteed to lead to more happiness, and give you a generally positive outlook on life (most days at least). So what are you waiting for? 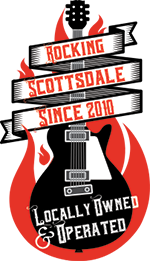 Take the first step to more happiness, by visiting Scottsdale Music Academy today!